Light is an integral symbol in the Christian faith,especially during Christmas. The light of a single candle can disperse the deepest darkness, bringing warmth, comfort, and illumination. The soft, warm candlelight at a Christmas Eve service creates an atmosphere of worship and reverence as congregations celebrate the arrival of the Light of the world. 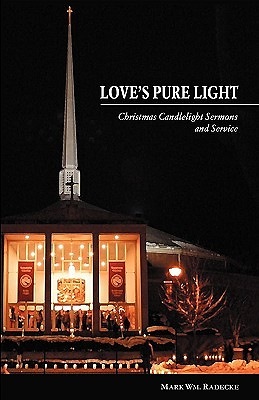 Love's Pure Light is a collection of insightful Christmas sermons delivered at Susquehanna University between 1997 and 2006. This bookoffers pastors a valuable source of inspiration for Christmas sermon preparation. Love's Pure Light also includes an order of service, providing congregations with a complete Christmas candlelight worship experience. Love's Pure Light will be a welcome addition to congregations of any size, aiding them in perceiving the power of the Light of Christmas in a deeper and more dynamic way. Mark Wm. Radecke serves as Chaplain at Susquehanna University in Selinsgrove, Pennsylvania. He holds degrees from Lutheran Theological Seminary at Gettysburg (M.Div. ), Trinity Lutheran Seminary (S.T.M. ), and Princeton Theological Seminary (D.Min.). He is the author of the CSS titles In Many and Various Ways, In Christ - A New Creation, and God in Flesh Made Manifest.